Erasmus Darwin, Charles Darwin’s grandfather, was the first Briton to explicitly write about evolution. His main prose on the topic appears in the first volume of Zoonomia in 1794. In the chapter “On Generation,” Erasmus Darwin discusses the descent of life from a microscopic common ancestor, sexual selection, the analogy of artificial selection as a means to understand descent with modification, and a basic concept of what we now refer to as homology (Richard Owen coined the term in 1843, but the concept had been in use for decades before then). While transformism is dealt with only briefly over the course of several pages of Zoonomia, these important ideas would all be exponentially expanded upon by his grandson Charles Darwin in support of his evolutionary theories in Origin. Erasmus Darwin’s thoughts on the diversity of life and evolution also appear in the Loves of the Plants (first published in two parts in 1789 and 1791), Phytologia (1800), and his last work, The Temple of Nature, published posthumously in 1803. Interestingly, if not somewhat disingenuously, in his 1876 Autobiography, Charles Darwin wrote with reference to his grandfather Erasmus Darwin’s evolutionary views, that it was “probable that the hearing rather early in life such views maintained and praised may have favoured my upholding them under a different form in my Origin of Species.” Yet, in his Historical Sketch on the Recent Progress of Opinion on the Origin of Species (added to the third English edition of Origin), Charles Darwin barely credited his grandfather’s influence, relegating him to a mere sentence in a footnote: “It is curious how largely my grandfather, Dr. Erasmus Darwin, anticipated the erroneous grounds of opinion, and the views of Lamarck, in his ‘Zoonomia’ (vol. i. p. 500-510), published in 1794.” That Erasmus Darwin upheld evolutionary views, and that his grandson Charles read his most widely known work on the subject – Zoonomia – both before and after attending university must certainly have provided Charles Darwin with a clear sense of freedom to explore what was then still viewed as a radical set of ideas. Erasmus Darwin, a medical doctor by profession, was not only an extremely well-read student of the natural sciences, but also a widely known poet and inventor. He was the founder of the Lichfield Botanical Society and a member of the remarkable Lunar Society, a group of Midlands enlightenment scholars and inventors who met regularly and advocated for the abolition of the slave trade (other members included Matthew Boulton, James Watt, Josiah Wedgwood, Joseph Priestley). In 1797, Samuel Taylor Coleridge remarked that Erasmus Darwin was “the first literary character in Europe, and the most original-minded man.” By the end of his life, Erasmus’ liberal views (he supported the American and French revolutions) led to vicious attacks by conservative forces in Great Britain. As such, he was lampooned in political cartoons and published satire that linked his evolutionist views with radical and revolutionary France. 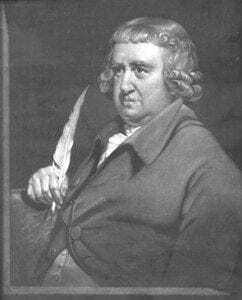 Desmond King-Hele, Darwin’s foremost biographer, writes in Erasmus Darwin: A Life of Unequalled Achievement, that it was the fossil remains of extinct species found during the 1767 excavation of the Harecastle Tunnel that first suggested to Erasmus a common origin of all animals. The centrality of evolution to Erasmus Darwin’s worldview was first publicly evidenced by his appending of the words “E conchis omnia” or “Everything from shells” to the three scallop shells on his family’s coat of arms in the early – and having this incorporated into his bookplates, as well as painted on the outside of his horse-drawn carriage (this would land him in trouble with the Canon of Lichfield, Thomas Seward). Erasmus Darwin’s thoughts on the diversity of life and evolution first appear in writing in his poem, the Botanic Garden, containing The Loves of the Plants and the Economy of Vegetation (first published in two parts in 1789 and 1791) which historian of biology Janet Browne calls, “an early study in Darwin’s lifelong commitment to the idea of transmutation” (604). “From thus meditating on the great similarity of the structure of warm-blooded animals, and at the same time of the great changes they undergo both before and after their nativity; and by considering in how minute a portion of time many of the changes of animals above described have been produced; would it be too bold to imagine, that in the great length of time, since the earth began to exist, perhaps millions of ages before the commencement of the history of mankind, would it be too bold to imagine, that all warm-blooded animals have arisen from one living filament, which THE GREAT FIRST CAUSE endued with animality, with the power of acquiring new parts, attended with new propensities, directed by irritations, sensations, volitions, and associations; and thus possessing the faculty of continuing to improve by its own inherent activity, and of delivering down those improvements by generation to its posterity, world without end!” (552-553). Zoonomia was reviewed in the September issue of the 1794 Monthly Literary Review. Although Darwin is described as “well-known,” “an ingenious philosopher, of extensive knowledge and large inquiry” and “a poet, distinguished beyond most of his contemporaries by the boldness of his imagination”, the reviewer is noticeably reserved in praising the content of Darwin’s transformist theory. After describing it in detail, the reviewer writes: “We shall make no remarks on this system, referring to the work itself such of our readers, as are disposed to take pleasure in viewing the progress of such an ingenious fancy in working up a little fact with an abundance of conjecture” (Monthly Literary Review, 1;12). This tepid review notwithstanding, Zoonomia went through multiple editions and printings in London, as well as in Dublin, Boston, Philadelphia and New York – and would be translated into Italian (two separate editions), German, and French. Zoonomia was a widely circulated text whose importance in introducing the world to evolutionary ideas is likely to be significantly underappreciated. Erasmus Darwin’s evolutionary views were last articulated in poetic form in his final published work, The Temple of Nature (1803). In romantic couplets (with extensive prose footnotes), Darwin presents a view of a deeply evolutionary world. Darwin proposes that all life evolved from “first forms minute” which arose “without parent by spontaneous birth” (Canto I), thereby tackling the question of the origin of life, a topic that his grandson would assiduously avoid. And breathing realms of fin, and feet, and wing.” (Canto I). And view the victor with admiring eyes.—(Canto II). An embryon point, or microscopic ens!” (Canto I). Erasmus Darwin’s writings also make clear the extent to which his commitment to political and social progress were enmeshed with his biological views of progressive evolution. Amidst verses describing nature, he advocates for liberal reform, the abolition of slavery, and shows support for the American and French Revolutions.